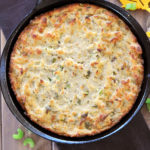 Mademoiselle is all about Mimi’s Thanksgiving recipes so here’s my easy Cornbread Biscuit Dressing! Its the best of both worlds, especially if you combine it with Giblet Gravy! Yum! Crumble biscuits and cornbread in very large mixing bowl, set aside. In a large cast iron skillet, saute celery and onion in butter. Stir in sage, saute 1 minute. Remove from heat. Cool. Whisk broth and eggs together. Add to sautéed mixture. Pour sauteed mixture into biscuit/cornbread crumbs. Stir to combine. Regrease sides of cast iron skillet. Pour mixture back into cast iron skillet. Bake, uncovered, for 45-50 minutes or until golden browned. If you are vegetarian or vegan, you may replace eggs with your favorite egg replacer or 1/2 cup almond milk, but reduce the vegetable stock by 1/2 cup. You may replace the butter with olive oil or double the amount of applesauce. You may want to increase your herbs and spices a bit, but otherwise you should have a fantastic dressing too! Last time we posted “the crust”, this time we are focusing on some ideas for pie filling. 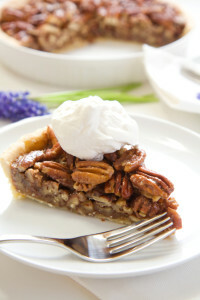 A favorite pie around our parts is pecan. This is a very versatile recipe that always turns out perfect! Beat eggs slightly in a 2 quart bowl. Stir in sugar, corn syrup and melted butter. 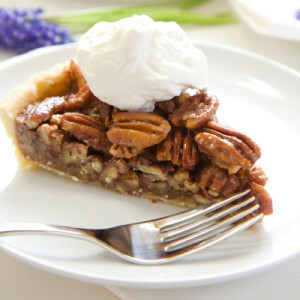 Add pecans (chopped or whole) either one cup for gooey pie and two cups for chewy, nuttier pie. Add filling to prepared raw pie dough. Bake in center of oven 35-40 minutes or until filling is slightly firm. 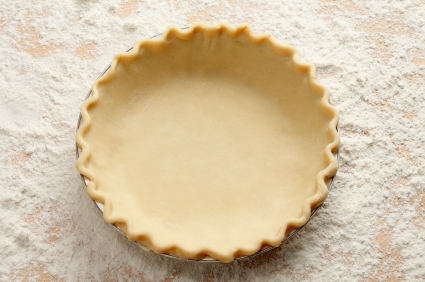 Center of pie may look soft when pie is gently shaken, but it will become firm when cool. You can add 1 Tablespoon of Whiskey or Bourbon (reduce the butter by same amount) for a kick or line the pie crust with a thin layer of fudge before you cook it if you want a bit of chocolate with your pecans. Serve with homemade whipped cream. Mademoiselle’s cooking for Thanksgiving and Mimi sent her a Greenberg Turkey! But, you cannot have your turkey without cranberry sauce. This recipe is so easy that you should NEVER use the stuff from the can again. If you are lucky to have any left after Thanksgiving, it stores just like jelly and is great on sandwiches until its gone! 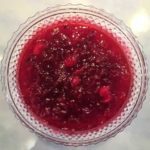 The basic cranberry sauce your grandmother made! Add sugar slowly stirring constantly until dissolved. Add cranberries, let simmer until popped. We are purists. No orange juice or zest. However, some people love the extra flavor this adds. If you want a hint of orange add 2Tbsp orange juice and a teaspoon of zest. Chopped pecans are also an option. Mimi and Mademoiselle cannot get enough of desserts, especially as we approach the holidays. We want to give you lots of reasons to make “the crust” a staple in your cooking repertoire so here is another pie in the sky option, Mademoiselle’s Cherry Pie. We guarantee that if you take this as your contribution to the holiday meal, you are assured a return invitation! 2 Cans Tart Cherries (not pie filling), drained. In a large mixing bowl, combine all ingredients and gently fold together. Pour into pie shell, cover with top crust, cut crust to vent or lattice. Bake at 425 degrees for 30-40 minutes. 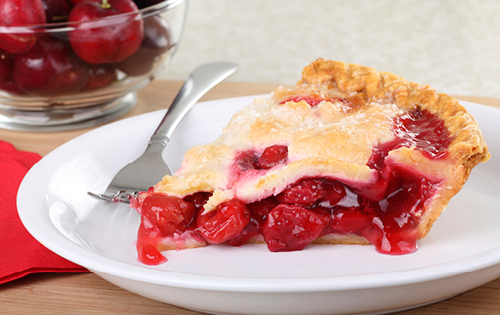 The secret to this pie is the tart cherries and the almond extract. It does not need the red food coloring, that is purely optional and we do not use it. We do occasionally dust with decorative sugar. Serve with homemade whipped cream or vanilla ice cream. Mademoiselle LOVES Halloween. Mimi and Mademoiselle would begin heated costume negotiations each August only to culminate in the ultimate Halloween costume choice for Mademoiselle. Tradition also called for an Open Door party with food, drinks and treats! Our menu: Chili and all the fixings and MDC margaritas! Food process onion and garlic into small pieces. Sauté under medium to high heat until translucent. Add both meats and cook until brown, continually using spooin or spatula to break up the meat into small bits. Once browned, add chili powder, cumin, basil, oregano and thyme. Stir well. Cook for a few minutes. Mix in crushed tomatoes, chicken broth, beer and tomato paste. Simmer until thickened to desired consistency, stirring occasionally to prevent sticking. Mix in beans. Simmer until ready to eat. 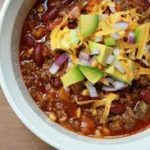 You can alter the fat in the chili by the fat content you use in the meat. You can adjust the heat by adding more or less chili powder or a bit of cayenne. We make a double recipe of this chili to feed everyone, but be prepared that it takes a big pot for 3-6 lbs of meat! Serve with chopped red onion, avocado, chopped cilantro, sweet hot jalapeños, fresh jalapeños, sour cream, shredded cheese and any other hot sauce of choice. Don't forget the Fritos and cornbread too! Mimi and Mademoiselle love salmon. So, when we figured out a new way to make salmon, we had to share. We have a chef friend that inspired this recipe, so we will call it Salmon Li! You can have your fishmonger debone and butterfly the salmon steaks or its so easy to do so yourself. Here’s a butterfly tutorial here. Our secret is the Soy Vay Very Very Teriyaki marinade…We have made so many marinades from scratch, but it doesn’t make sense when this one is so readily available. Enjoy! Marinate salmon steaks with Soy Vay or your favorite teriyaki marinade for 30. Heat a skillet or griddle greased with sesame seed oil to 375 degrees. Place salmon steaks on heat for 4-5 minutes each side, basting with marinade as you cook each side. Thats it! You can cook broccoli rabe or sugar snap peas in the same marinade on the griddle or skillet. Make some orzo or rice and you have this quick delicious meal in a snap! Mademoiselle loves an easy recipe! I know its Spring, but I have two friends under the weather and I need to make them a dinner. Chicken soup sounds yucky, so how about Mimi’s easy chicken pot pie cheat. It is so easy and quick, it is delicious and it refrigerates and freezes beautifully. It is the perfect, “get well soon” gift. A quick easy no sauté chicken pot pie! 2 Ready Made Pie Crusts - We use Immaculate Bakery Pre-Made Crust, but Pillsbury works too. Mix sour cream, canned soup and butter until creamy. 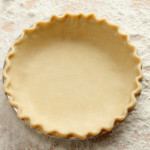 Cover pie crust edge with metal or silicone pie protector (or aluminum foil). Place in middle rack of oven and bake for 30 minutes. Bake an additional 15 minutes or until crust is golden brown and bubbly filling is coming through slits. If you are a vegetarian, just use cream of celery or cream of mushroom soup and omit chicken, but add cooked chopped broccoli, cauliflower and lima beans. Oh Yes! Mimi and Mademoiselle did make these with the Dean herself! And, Oh Yes! They were awesome! In honor of our 20Q interviewee Suzanne Pollak, we bring you a recipe from her Charleston Academy of Domestic Pursuits: A Handbook of Etiquette with Recipes for some of the best biscuits you’ll ever have! Easy to make, and simple to make your own by adding cheese, herbs and spices. The CADP also has a fantastic video series on YouTube, where you can watch how easy it is to make these! In a large bowl, whisk together the flour, baking powder, salt and baking soda. Using two knives or a pastry blender, cut the butter into the flour until it forms pea-size pieces. Add the buttermilk and stir with a wooden spoon until the dough almost forms a ball. Place the dough on a silicone baking mat and begin folding up the sides, right and left, until a ball forms. Using a rolling pin, roll out the dough to 1/2-inch thickness. Fold one side of the dough into the center and then fold in the other side. Roll out again and refold in the same manner three to six times. 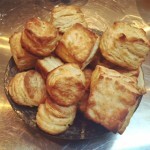 (Each roll and fold creates flaky layers within your biscuits.) Roll out one final time until the dough is 3/4-inch thick. So, you have mastered Breakfast with Banana Bread and Lemon Poppy Seed Muffins and the Academy Biscuit; Lunch with Mimi Soup; and dinner with Chicken and Noodles, but we have yet to discuss a real dessert that is quick, easy, satisfying and impressive. We thought about all of our recipes and decided instead of a cake or cookies, we get the most compliments on our pies. Once you have a crust, pie is very versatile. You can make nut, fruit, custard and pudding pies. You can also make quiche, pot pies, turnovers or other desserts. Trust us, an impressive pie is a lot easier than you think! First: Master a crust. Mademoiselle swears that you cannot beat Immaculate Bakery’s Pre-Made Crust. In a pinch she uses Pillsbury. So does Mimi, but Mimi has an easy go-to recipe for crust. Stay tuned for our pecan and cherry pie fillings! In a large bowl combine flour, sugar, kosher salt and baking powder. With two knives or a pastry blender cut in all of the butter, leaving chunks the size of peas. Combine remaining wet ingredients in a small bowl or pitcher. Add liquid mixture all at once to dry ingredients/butter mixture. The finished dough should break, not stretch. Use at once or wrap in parchment and plastic wrap. 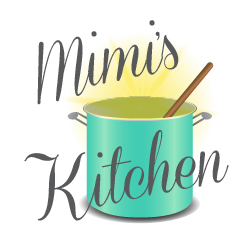 Mimi uses a food processor and it makes this quick and easy. Just do not overwork the dough. Once you have made this recipe a few times it gets easier and easier. This crust is especially delicious with more savory pies. Mademoiselle loves to expand her culinary skills! 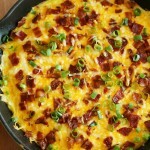 She needed to make a quick brunch for a few friends so I sent over this super easy Potato and Bacon Frittata recipe. It could even be a big hit for Father’s Day, if you are in charge of cooking! So easy and delicious! Combine eggs, milk, salt and pepper, set aside. If using herbs add them here. Add frozen potatoes and cook until browned, but not too crisp. Pour over potatoes. As the egg mixture starts to cook, gently lift the edges of the frittata with a spatula tilting pan to promote even cooking. Continue lifting and flowing egg underneath the frigate until the center is cooked. If you have difficulty cooking center place a lid on top for 2-3 minutes or turn over gently. Remove from pan to platter. Sprinkle with cheese. Cover for 5 minutes or until cheese is melted. Add bacon. Add other toppings or place chopped toppings or salsa on the side. If you use a cast iron skillet you can serve stove-top to table!